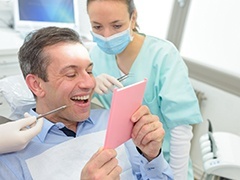 Dr. Salivonchik crafts custom dental solutions for every single patient in need. If you have one or more missing teeth, he may recommend state-of-the-art dental implants. A periodontist places the implants, and Dr. Salivonchik creates and places custom-made replacement teeth on top of them. This collaboration ensures that our patients receive the highest level of care that we can provide. As our patient, you’ll enjoy our undivided attention before, during, and after your smile’s transformation. In the end, it will seem like your teeth were never missing in the first place! To schedule a consultation and learn more about what dental implants could do for you, contact us today. Why Choose S. John Salivonchik, D.M.D., P.C. for Dental Implants? Dental implants will improve your smile’s appearance, comfort, and function. You won’t experience the jawbone loss that occurs when teeth are missing, and you needn’t worry about embarrassing slippage that sometimes accompanies traditional replacement teeth methods. Many patients report that they look younger with dental implants, due to the support provided to facial skin and muscles. 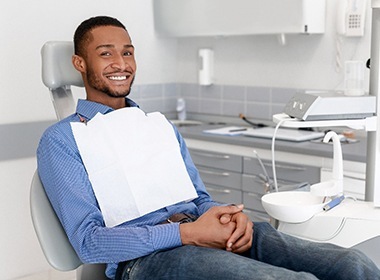 Unlike with a traditional bridge, in which a replacement tooth is secured using crowns on the adjacent teeth, a single dental implant crown can be positioned between two healthy teeth without affecting them at all, better preserving someone’s natural smile. 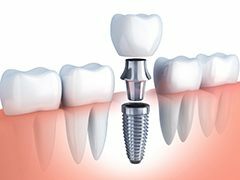 For patients missing teeth throughout the mouth, multiple dental implant crowns can help close the gaps. If a patient has a gap due to consecutive missing teeth, just two implants can be used to support a prosthetic that restores up to four teeth, providing a more efficient and affordable solution. Even a full or partial denture can be held in place using dental implants to help patients missing several teeth. Because the prosthetic is attached to the jawbone, patients don’t have to worry about their prosthetic shifting unexpectedly. Plus, implant-retained dentures have also been shown to maintain their fit for much longer compared to traditional ones. After a thorough evaluation to determine your candidacy for dental implants – including the use of advanced technology to assess jaw structure and measure bone density – our implant team will map out each step in your smile’s restoration. 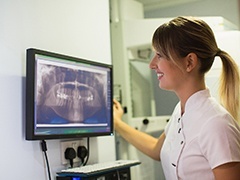 Some patients require bone or sinus grafting to alter bone structure prior to implant surgery, as well as general dentistry services to improve oral health. No matter your needs, Dr. Salivonchik and our periodontist will ensure you receive the care you need. Dr. Salivonchik will assess whether to wait until osseointegration occurs (the 3-month to 6-month process during which your jawbone fuses with the implant posts) to place your replacement teeth, or whether you qualify for immediate attachment of your prosthetic(s). Regardless of the process for which you qualify, you’ll never be without teeth during the dental implant process. To begin the dental implant process, our periodontist places one post for each missing tooth or a few precisely positioned in the jawbone to secure a denture, partial, or bridge. 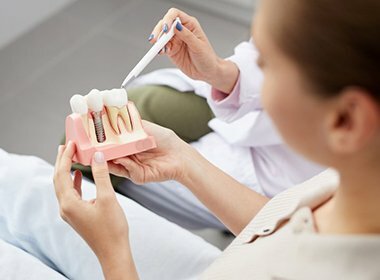 Dr. Salivonchik designs your custom replacement teeth, and a skilled artist at a highly respected dental lab fabricates the final restorations. 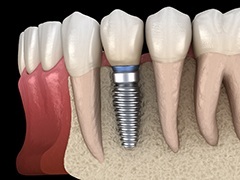 Every dental implant treatment is fully customized based on a patient’s unique needs, so as a result, there is no fixed price for the procedure. Factors such as how many implants a patient is receiving, what kind of restoration is needed, and any necessary preparatory procedures can all influence the final cost. 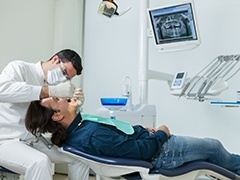 So, how much will it cost YOU to get dental implants? We can let you know at a one-on-one consultation where we can answer this and any other questions you might have. While dental implants can be a significant investment, they often end up costing patients less compared to traditional bridges and dentures. Why? Largely because of their longevity. With a regular restoration, a patient will have to pay to have it replaced multiple times over the years, but with implants, they are often just a onetime cost, able to last for the rest of a patient’s life with maintenance.